It was another beautiful day in paradise. The temperature was in the mid 70's with a strong, warm south wind. I could say the wind was always at our backs but that would be a lie. It seemed the wind was always in our faces. We did the normal route of 11.5 miles. I never counted the bikers/skaters but it was a good group. 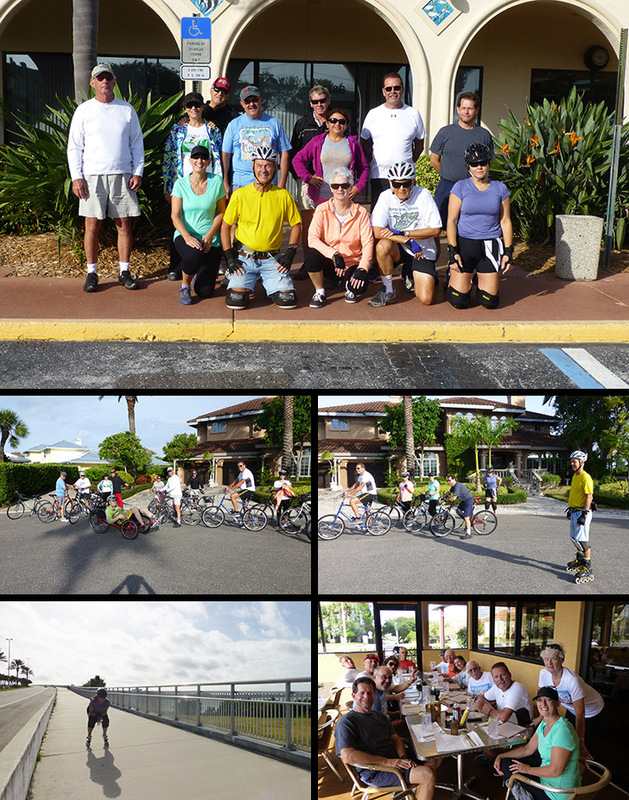 Vivian A. was the only skater that took the ride down the Clearwater Bridge along with a few bikers. A couple people missed the picture but they are in pictures at the web page. We dined at Georgie Boy Restaurant as planned. Calling ahead was a big help. They have always taken care of the group. We had a 10-15 minute wait for our tables which was in the screened area and we had it to ourselves. Several rated the food as a 9.8. A good time was had by all. We did miss Bruce.